Sean Simmonds makes his full project debut on Xist Records with considerable razzle dazzle, combining his penchant for deep organic soul with urban sensibilities and catchy melody. True Story is the album. The Toronto native blazes the music box with the phat jam, "Look At Me Now", written jointly with Montrel Darrett. The cut has appeared previously on compilations, (Madison Mission Smooth Gospel Vol. 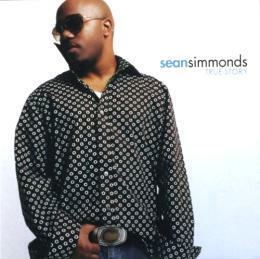 1, see album review), and nicely intro’s Simmonds in his very comfortable neo-soul pocket as he offers his testimony over a snaggy melody (read interview). "For Love", produced by Kelvin Wooten, showcases Simmond's ability to deftly jump into soulful falsetto, and then just as quickly return to his tenor base, making for highly evocative interpretations of deep soul balladry. The song prods us to answer "what we'd do for love", warning of dangers and providing encouragement to wait for God's timing. The song is reprised at the album’s close as a bouncing remix by The Collective and featuring rapper Octave. The snappy "Don't Do" and it's equal "Can't Stop" continue in much the same vein, both songs flirting with a hip hop vibe before giving over to organic soul. On “Won’t It Be”, Simmonds shows his gift for smooth balladry. Nestled in some gorgeous guitar work courtesy Norris Jones, Simmonds sings of the glories of heaven, and anticipates meeting the One who has brought salvation to make that journey possible. Hallerin Hilton Hill pens this album high point. “Soul Glo” and “Sorry For” continue the solid soul excellence, and “God Bless The Ghetto” (with producer Linxkaneck on board) makes a strong case for putting Simmonds and team in the running for song of the year (co-written with Darrett and L. Martin). GOSPELflava.com declared Sean Simmonds to be an artist to watch in 2004, and we’ll say it again now. He is a bonafide, hit-bound vocalist who presents a winning combination of pipes, music and message. If you haven't already, it's high time to take notice of this True Story. All content in GOSPELflava © copyright 2006. No information to be reprinted or re-broadcast from this site without the expressed written consent of GOSPELflava.com. All rights reserved.